I have long considered Florida my second home. It was the first place I visited outside my own country and I’ve been back every couple of years since the age of four. A friend of mine was working remotely in The South this month and I decided to take an extended weekend to visit him. Originally I was going to meet him in Alabama, as it is a state I have yet to visit and one at the top of my list (I am a southern girl at heart). However, the timing didn’t work out and so I was left with the option of visiting him in south Florida. At first I was incredibly disappointed, as I have spent so much time in The Sunshine State, I was debating not going at all. However, I can not let a chance to go travelling, or on vacation pass me by, so off I went. The Eastern Coast of North America has had an unseasonably mild winter, with little snow and few days below zero. However, on the day I was to travel a huge storm hit the Eastern seaboard. I had woke at 5am and Ubered out to the airport to make my flight and was really looking forward to getting sleep on the plane, this however was not the case as I was at the mercy of turbulence the entire ride. I was not prepared for the humidity when I landed in Miami. Having always visited during Florida’s dry season (which it is still meant to be experiencing) I haven’t seen much rain there and it was incredibly odd to be driving down the highway watching lashing rain against the flimsy leaves of Florida’s palms. We stayed our first night in Homestead, as we were driving down to The Keys the following day. Our first stop was at Robert is Here fruit stand, to have his famous milkshakes. I usually go for a variety of Key Lime, but I opted this time for a classic strawberry, as I had been waiting eight months since I had tried my cousin’s last year. We wandered around the outdoor fruit stand and had a visit with the animals kept in the back. 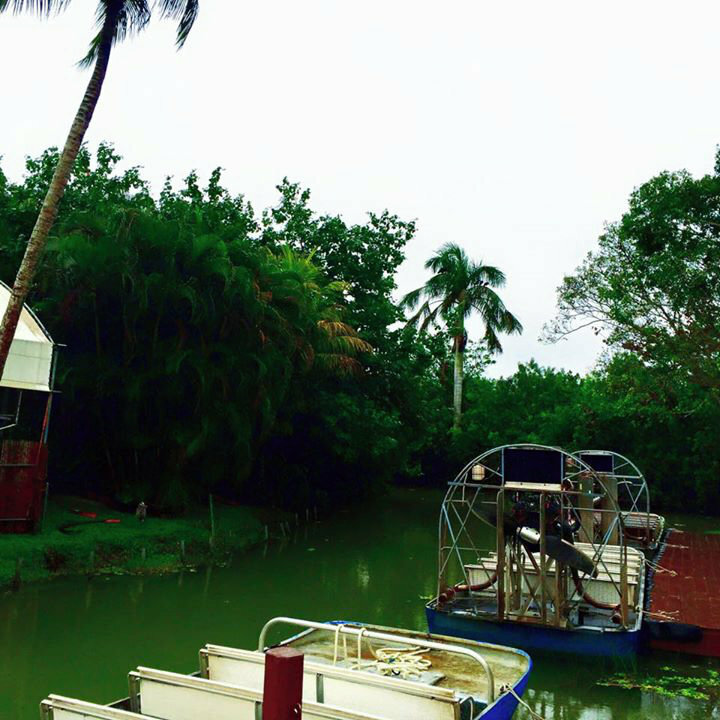 Following our milkshakes we drove into The Everglades as we wanted to take a fan boat ride through Florida’s swamps. The closest ride was at Everglades Alligator Farm and we arrived just in time for a departure. We were forewarned by the driver that a huge storm was coming in, but that we might be able to beat it. Our entire group turned around to see one of the blackest clouds swiftly rolling in. We all decided we were already there and we’d like to give it a go. The ride started out enjoyable, with just a bit of rain, and with the sight seeing of one alligator, then as we turned a corner to exit out onto the marsh the sky opened up and just poured down on us. None of us could see a thing and were absolutely drenched in seconds. The driver ended up taking us back to wait off the storm as he could barely see where he was going. Though, we ended up being refunded as the storm never let up before dark. Although it wasn’t the experience we were looking for, it was none the less an experience. We ended the night at a seafood restaurant, The Mutineer for dinner. I had red wine and pasta with lobster and shrimp, which the waiter let me swap in alfredo sauce for the marinara. The restaurant is very kitschy in appearance, but the food was delicious.